In Agullent elaborate, completely handmade, sheepskin balls, squash, and gloves. The development of these parts follows the traditional parameters that govern the manufacture of these elements linked to Valencian ball game. While at the same time keep the secrets of the craftsmen agullentins, which guarantee excellent results. The balls are made carefully by experts where creativity has no limits. The company Va de bo was founded in the early eighties. The artisan Amparo Pascual has inherited the knowledge of their parents, which eventually were forging a special wisdom that made them unique. She continues today generational legacy from father to son has improved without losing the essence of a work, the building block is the self-imposed, the quality of raw materials and the continuing effort to provide greater daily range balls and quality. 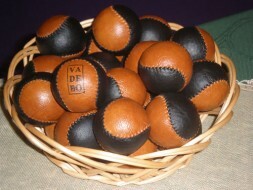 In the company Va de bo, are made balls of different characteristics, both in weight, texture, size and boat, suitable for playing different ball arrangements that exist in the Valencian community, and for all categories.